Roman blinds offer a softer more luxurious look than some other blinds and can be made from any soft fabric which enables you to create a blind which will fit with your furnishings and virtually any interior design you may have. Roman blinds can be manufactured without any lining, with a standard lining, self lining or with a blackout lining which then makes them ideal for bedrooms. They can also be manufactured with borders, shaped bottoms or eyelets which further allows you to create your individual style. In addition, they can be manufactured using your own soft fabric which allows you to match perfectly to your existing curtains, cushions, etc. 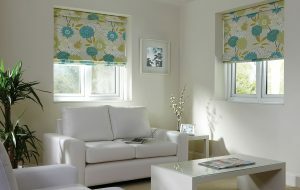 Operation of Roman blinds can be manually by means of a continuous loop chain or motorised with operation by remote control.